Nothing can keep these two women down. An Alaska Airlines captain with a big heart and two great kidneys gave a flight attendant a new lease on life earlier this year, and now Captain Jodi Harskamp and Flight Attendant Jenny Stansel are back to work. Stansel had battled chronic kidney disease for 15 years, but it came to a head when she nearly collapsed at work over a year ago. When Harskamp heard Stansel’s request for help, she didn’t hesitate to donate one of her kidneys so that Stansel could live. Harskamp and Stansel have been there for each other in many ways since their surgeries on March 16. 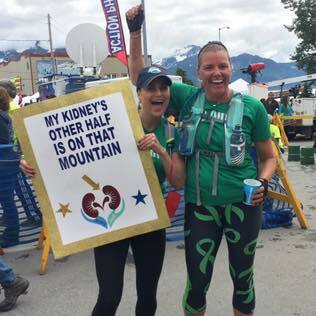 Harskamp ran the Mount Marathon Race in Seward, Alaska, to “warm up for coming back to work.” At the end of the challenging race up and over a nearly 3,000-foot mountain peak, Stansel stood at the finish line holding a sign and cheering on her kidney’s other half. Harskamp and Stansel flew their first flight together on July 23, just four months after their successful transplant surgeries. Harskamp recently passed all of her medical screenings, as required by the Federal Aviation Administration, and Stansel came back to work filled with such energy and zeal that if you didn’t know her story, you would never guess she had been so ill, so recently. The pair headed from Anchorage to Bethel, Alaska, and two days later, their plans included fishing for salmon. Now back at work, Harskamp and Stansel are sharing their new-found passion: organ donation. Harskamp wants to raise awareness about living organ donation and has found that sharing her story has changed the perceptions of her coworkers, friends and acquaintances. “Share your spare,” has become a mantra for Harskamp and Stansel, as they encourage all those interested in organ donation to visit the National Kidney Foundation, the United Network for Organ Sharing, or to check out state Organ Donor Registries. You can try and catch Stansel on her fan-favorite route between Nome and Anchorage, or see her and Harskamp on flights into and out of their home base at the Anchorage International Airport. 4 comments on "Share your spare: Captain and flight attendant return to work after kidney donation"
Although retired after 22 years from AS in 2008, my gratitude is strong and heartfelt as ever at having served onboard the finest airline ever — Alaska Airlines. Truly inspiring, keep up the great work! That was an awesome thing to do, very generous. This is why I fly Alaska!